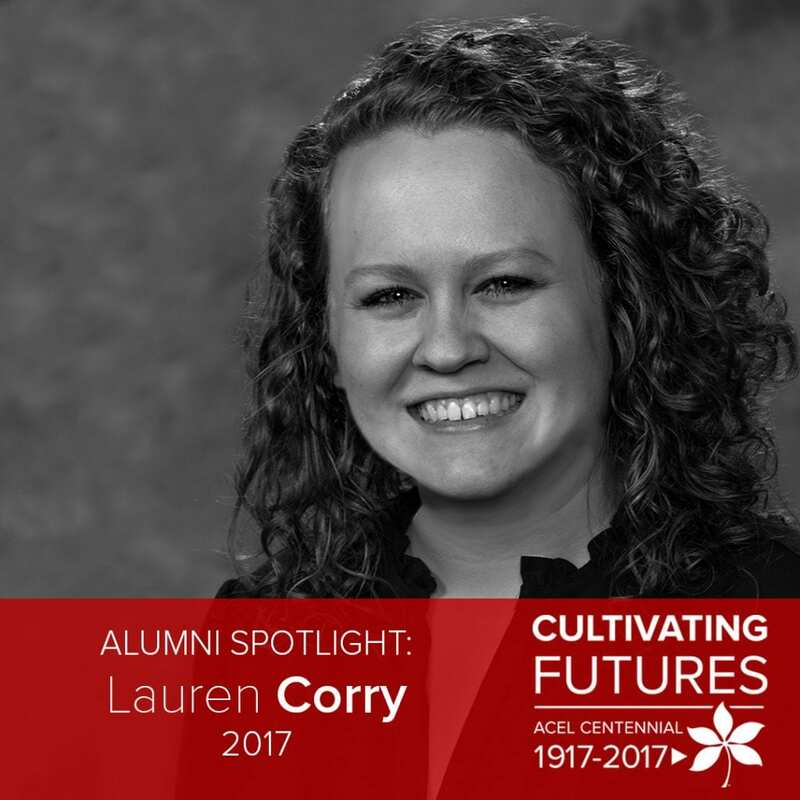 Lauren Corry is a 2017 graduate of the agricultural communication program at Ohio State. Corry, originally from Xenia, Ohio, is now the director of communications for the Ohio Beef Council and Ohio Cattlemen’s Association. [ACEL]: Hi Lauren! 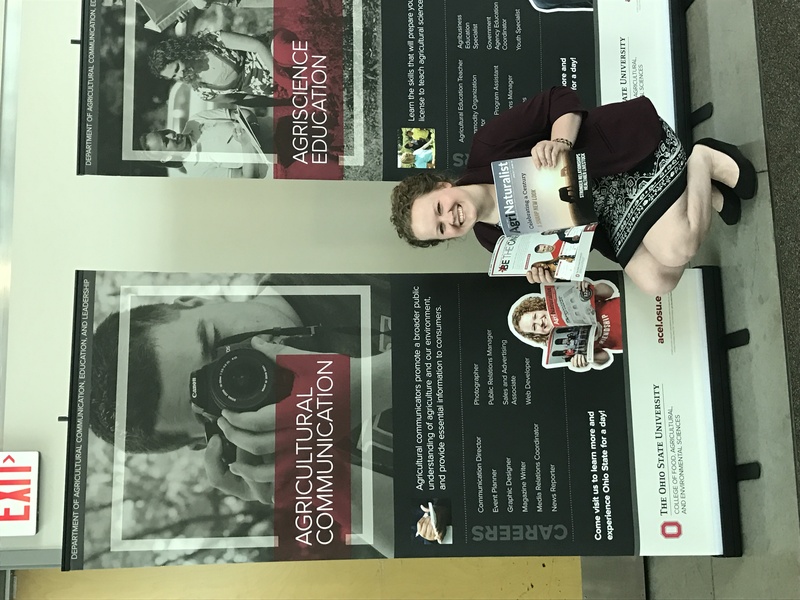 Share with us why you chose to major in agricultural communication at Ohio State? In elementary school, I was the kid who enjoyed indoor recess because I could mess around in Kid Pix or Microsoft Paint in the computer lab. In high school, like most others, I enjoyed each activity I involved myself within my FFA chapter. Agricultural communication ended up being the perfect balance of utilizing my creative instincts and passion for agriculture. I chose Ohio State because of family tradition. 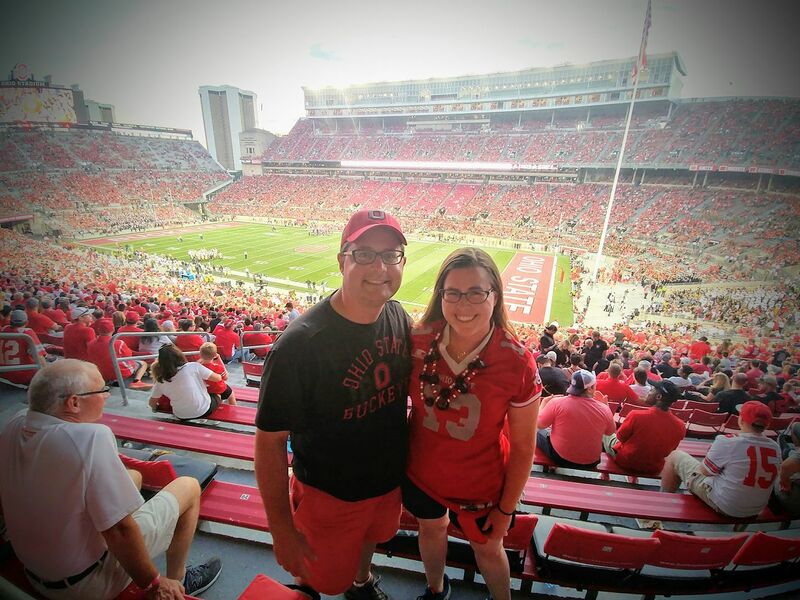 Both of my siblings and parents attended Ohio State, so becoming a Buckeye was a natural fit and childhood aspiration (…and I’m not entirely sure I had a choice). How did your education at Ohio State influence your choice of career following your graduation? Not once did I doubt my decision to major in ag comm. I knew I was in the right place. 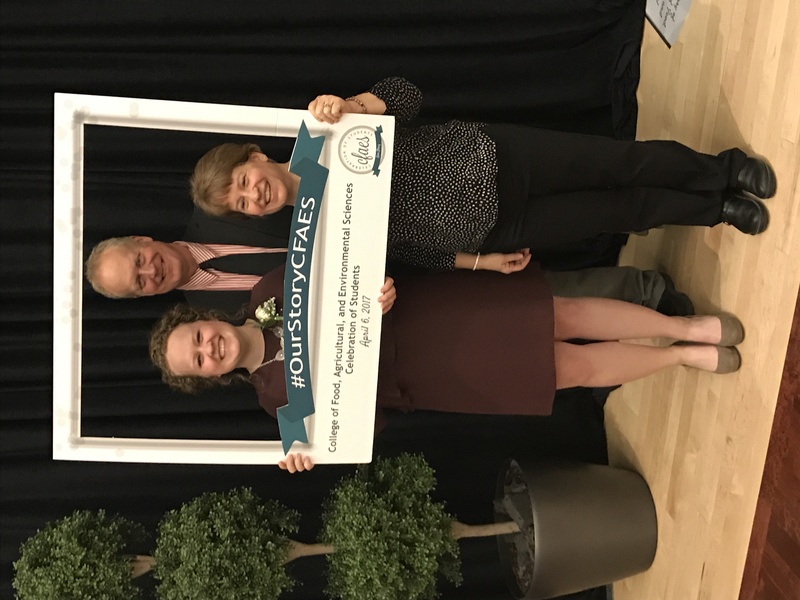 My internships at Ohio Farm Bureau and Ohio Beef Council/Ohio Cattlemen’s Association confirmed that and started to show me career possibilities that aligned with my coursework. I was lucky enough to be offered a position where I had previously completed an internship and started full time the day after graduation. Outside of the classroom, how were you involved in campus? I was active in Saddle & Sirloin, Agricultural Communicators of Tomorrow and the CFAES Celebration of Students Steering Committee. During my four years on the committee, I gained so much “outside of the classroom” experience. I dabbled in solicitations, video production, logo creation, brand guidelines, ordering print materials and social media management. I also had the opportunity to serve as the AgriNaturalist design editor during our capstone class. These opportunities really set me up for success in understanding many of the responsibilities I would need for my current position – I put together a magazine every few months now and work on similar tasks on a day-to-day basis. Cultural proficiency with Dr. Susie Whittington, photography with Dr. Buck and BBQ science with Dr. Cressman and Dr. England were some of my favorite classes at Ohio STate. My absolute favorite class was cultural proficiency with Dr. Whittington because it encouraged self-awareness and created an atmosphere hospitable for tough, but important, conversations. I also really enjoyed the volunteer opportunities associated with it. The class was a great reminder to be open to many different perspectives on life. Dr. Buck and Dr. Specht were both extremely supportive and helped me refine my communication skills throughout each class. Dr. Trefz and Dr. Flood constantly challenged me to improve and try new experiences from my freshman year on. I am very thankful for each of their influences as they helped me not only during my time as a student, but also have had lasting effects post-graduation. Maybe it was walking through the streets of London while studying abroad. Maybe it was the friendships and connections made during my internships. Maybe it was a trip to a conference with a student org. Whatever it is, I’m forever thankful for the memories made and the path that led me to Ohio State, CFAES and ACEL. I am still in my first position after graduation as the director of communications of the Ohio Beef Council and the Ohio Cattlemen’s Association. I have similar responsibilities for both organizations including graphic design, social media management, website updates, photography and press releases. It’s fun to look back and see how much has changed in the past year. As of right now my favorite highlight is noticing self-improvement and how I’ve grown since I first started in my position. Find opportunities to learn outside of the classroom. Take the internship. Find a mentor. Go to the conference. Study abroad. Switch up your learning environment occasionally, and you won’t even realize all the knowledge and useful skills you’re absorbing. As I got more involved and familiar with the department, I was forced to go beyond my comfort zone. ACEL cultivated confidence and a sense of community that couldn’t be replicated elsewhere on campus. Following my final CFAES Celebration of Students recognition event. In the endzone of Ohio Stadium! Go Bucks! 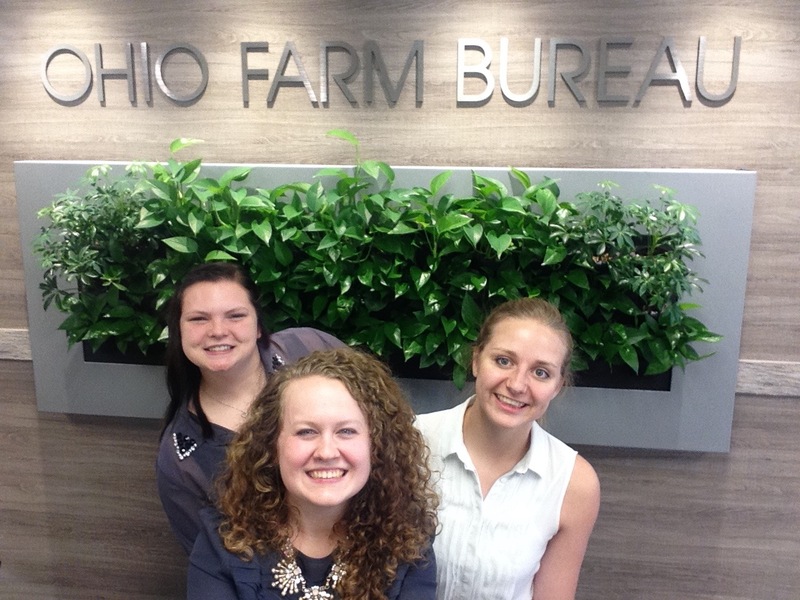 Me with my fellow Ohio Farm Bureau summer interns. Posing with the AgriNaturalist I created, next to the poster where I’m holding a previous edition. Whitney Fogle Gentry completed a bachelor of science in agricultural communication in 1993. Gentry now works as the leader of business development for the Fayette County Memorial Hospital. [ACEL]: Hi Whitney! You majored in agricultural communication as an undergraduate at Ohio State. Why did you select that major? English and writing were always my favorite subjects. Combining that with growing up on a small farm, agricultural communication and rural sociology seemed like the perfect combination. I was the only student in my high school who was involved in agriculture. 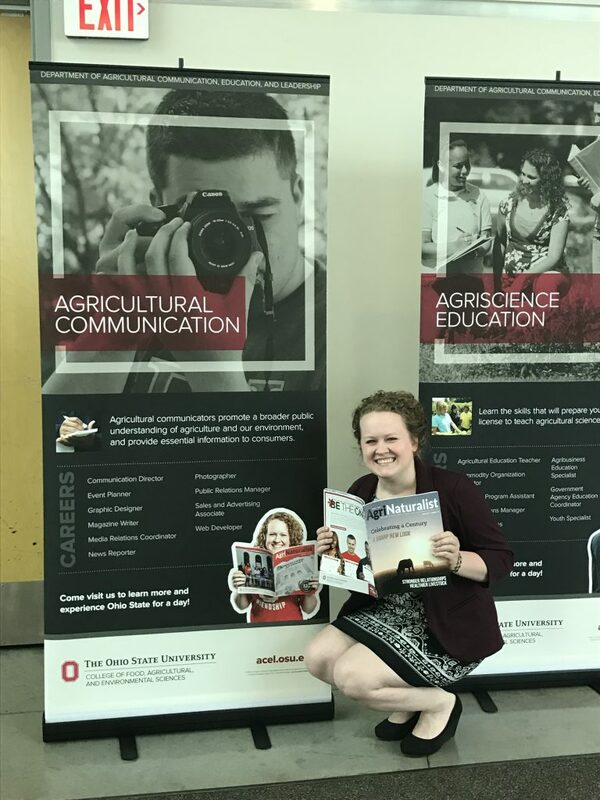 When I toured Ohio State and saw the dorm rooms of students studying agriculture and the pictures of their champion animals on display, I knew I’d be around people with similar interests. How did your education at Ohio State influence your choice of career ? Through school I stumbled on an internship with the Ohio Department of Agriculture’s Division of Markets for a summer. That helped me get my foot in the door and was my first full time job. I was a member off Saddle & Sirloin and worked just over two years as a resident advisor in Drackett Tower. Don’t really have a stand out. I remember everything from ice skating, to English, to agricultural economics, to Greek mythology. What faculty or staff member had an impact on your time at Ohio State? My boss at Drackett Tower, Tei Street. She has a drive for excellence and a zest for life! I don’t have just one single memory. There are so many! Fall football Saturdays, working the bull clip for Saddle & Sirloin, fun memories as an RA. They all add up to a great experience. I was the marketing specialist with the Ohio Department of Agriculture. What other companies have you worked for throughout your career? Ohio Dept of Agriculture, Ohio Farm Bureau, United Way of Fayette County and Fayette County Chamber of Commerce. My internship at ODA was to help organize the Pearl Alley Farmers Market in downtown Columbus. It’s great to see that still going and thriving and to now I had a hand in getting that off the ground. Get involved in as many extra curricular clubs and events as you can! Make the most of your time at OSU. 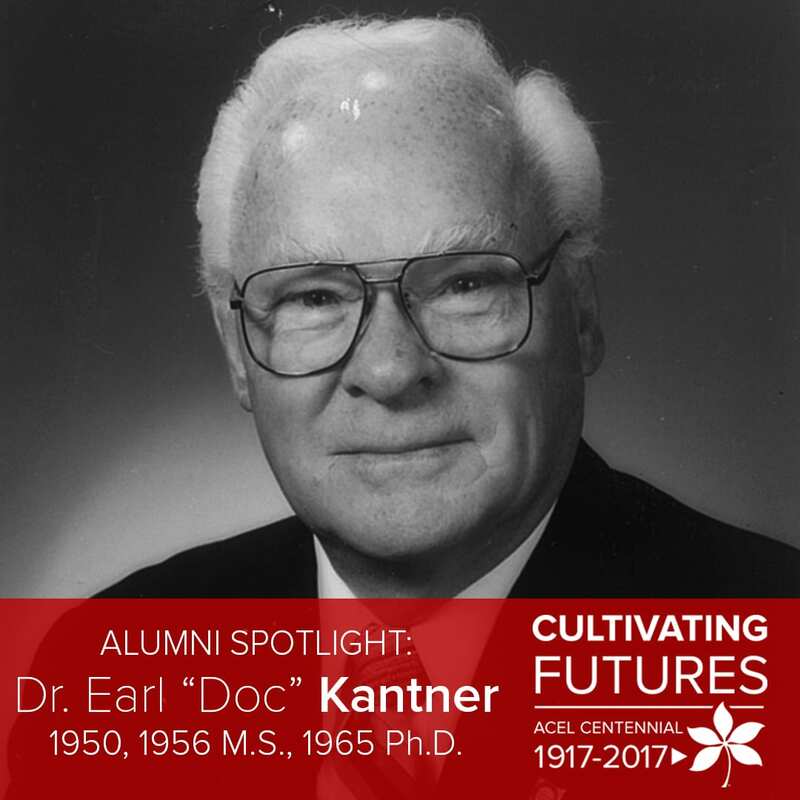 Alumni Spotlight: Dr. Earl “Doc” Kantner, ’50, ’56 M.S., ’65 Ph.D.
Dr. Earl Kantner is a three time graduate of the Department of Agricultural Communication, Education, and Leadership. 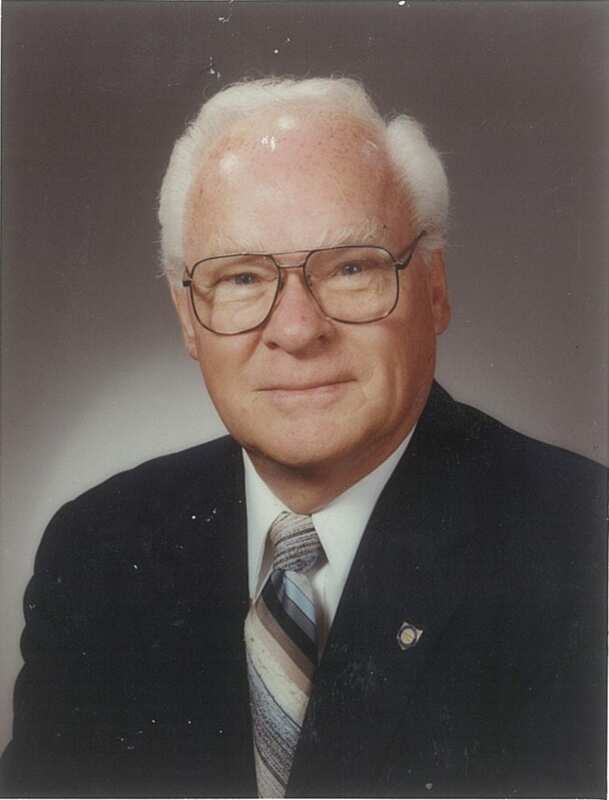 He came to Ohio State from Wapakoneta, Ohio with a goal of becoming an agricultural educator in 1946. He accomplished that goal when he spent eight years in agricultural classrooms and later achieved a career long dream of becoming the director of the Ohio FFA Association. Dr. Kantner is now retired and resides in Canal Winchester, Ohio. [ACEL]: Hello Dr. Kantner! Share with us why you decided to attend The Ohio State University and major in agricultural education. [Kantner]: Growing up on a good livestock and crop family farm gave me a strong base for a career in the agricultural industry. I had a strong interest in my high school agricultural classes, leading me to a defining decision to pursue a career as an agricultural teacher. I never wavered from that early decision, which led me to a dream lifetime career. 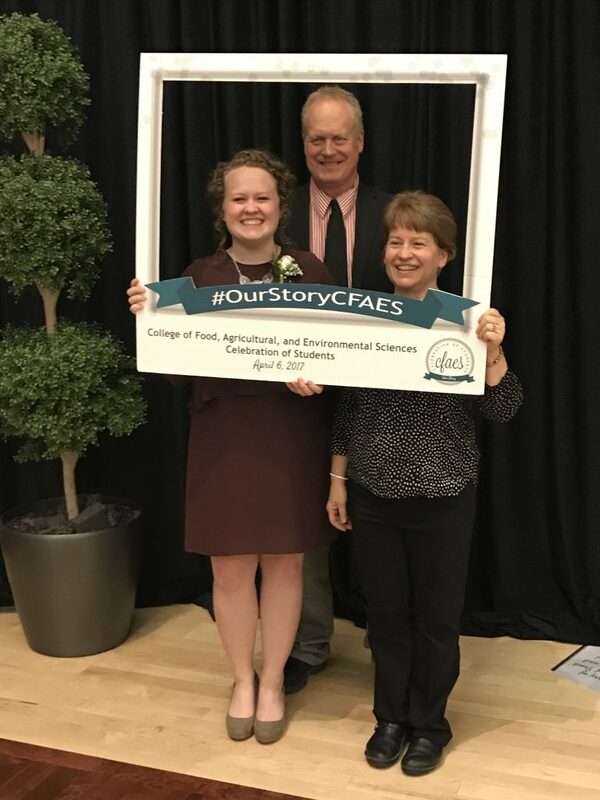 My choice for a college major was thus an easy one—College of Agriculture (now CFAES), Department of Agricultural Education (now ACEL), at The Ohio State University!! I wanted to attend an agricultural college in the Midwest. I considered Iowa State, Purdue, Kentucky and of course Ohio State! The decision soon emerged as an easy choice!! It was my home state university– Ohio State! (I have always been a loyal Buckeye). Ohio State had a top reputation as did the agricultural college and the agricultural education department. How could I possibly go wrong- Ohio State was my choice! How did your education at Ohio State influence your career or career path? The entire faculty of my major department – the Department of Agricultural Education, (especially Dr. Ralph Bender, department chairman) were very supportive of me and my career progress. They were very thorough, checking my course work, my work ethic and my specific progress. The coursework went well. I was, and still am… well satisfied. Overall, the education I received at Ohio State motivated me to reach my career long goal of becoming a teacher. I always put academic achievement first in my university life. I was able to accomplish this while being somewhat active in extracurricular activities. This routine resulted in a good balance for me. I was, and am, well pleased. What classes did you enjoy the most at Ohio State? The courses relating to my major (agricultural education) were my most enjoyable, since they related specifically to my future teaching career. I also enjoyed guidance, statistics, and research courses. They were difficult, but satisfying and would be useful in life and my career. What professor, faculty or staff member had an impact on your education or career? Dr. Ralph Bender was the Ohio State professor that made the greatest impact on me throughout my college experience. 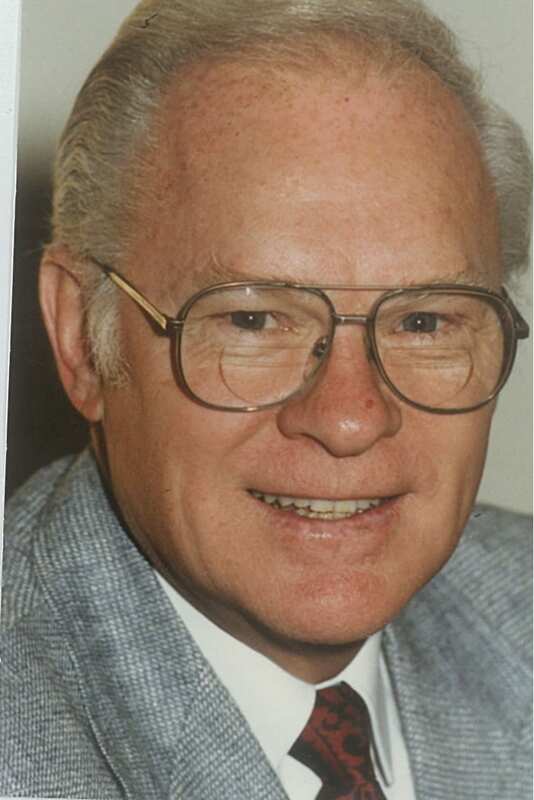 he was chairman of the agricultural education department at Ohio State and was well known and highly respected throughout Ohio, nationally and internationally. Dr. Bender chose to be my personal graduate school advisor, guiding me through my master’s degree and my doctoral program. It was Dr. Bender who urged me to pursue a doctorate degree, leading to higher career achievement. I was and will be, eternally grateful to Dr. Ralph E. Bender for his personal care guidance and support of me in my career (and life) preparation. I always enjoyed “learning” and my time at Ohio State was certainly no exception. It is nearly impossible to pick a favorite memory from the many, but I believe the classroom routine- the class- information and classmate comradery would be favorite memories. Fraternity life (Alpha Zeta) would be like wise be a strong favorite memory!! I’ll never forget– my first job following graduation from Ohio State was teaching— fulfillment of my high school dream of becoming a teacher. Immediately after graduation, I and other graduates applied for an agricultural teaching position at Ansonia High School, located in Western Ohio’s Darke County– A strong agricultural area. After personal interviews and a long (2 week) wait I received a personal phone call from the school superintendent that I was their choice to fill their open position. I was highly delighted — I accepted!!! Share with us the different positions you held throughout your career. My first teaching experience was at Ansonia High School in far western Ohio’s Darke County…a strong agricultural area. After two good years, I was offered a teaching position at Wauseon High School in far northwest Ohio , a larger school, teaching agricultural classes and training Ohio State student teachers assigned by Ohio State. After six great years at Wauseon, I was offered (and eagerly accepted) an appointment on the faculty of the Department of Agricultural Education at The Ohio State University. Duties at Ohio State included involvement in normal staff operations and especially operating the “southeast teacher training center…a typical high school setting for Ohio State’s teacher training program. It was a great position I kept for six years. In 1963 I was offered, and accepted, a position of assistant state director of the Ohio Agricultural Education Service with the Ohio Department of Education. This was the program that oversaw the agricultural teaching programs in 350 Ohio high schools. In addition to regular administrative state department operations, I was high excited to be appointed as director of the Ohio FFA Association – ironically my career long “dream job.” With great joy and appreciation, I accepted. What honors and awards have you been presented throughout your career? A number of companies, businesses and organizations and others presented plaques, certificates and other honors for my 44 years of dedication to Ohio youth preparing for careers in the agricultural industry through agricultural education and FFA. My appointment to the Department of Education, which included the position of director of the Ohio FFA Association was clearly my favorite career highlight. While I fully enjoyed administrative duties of being assistant state supervisor of the Agricultural Education Service, working with teen age young people in FFA was my “piece of the cake.” I truly loved the sky-high inspiring activities that occurred on a daily basis. I will be forever grateful for the opportunity to serve young people preparing for careers in the agricultural industry through the agricultural education and FFA programs. My single advice to a current student would be – take the HIGH ROAD – for your life journey!! Choose a “dream career” – one you would truly love!! A summation – plan ahead, take the high road, work diligently and – enjoy life! This was a major inspiration for me…and is sure to be for all – especially students. What did ACEL mean to you? 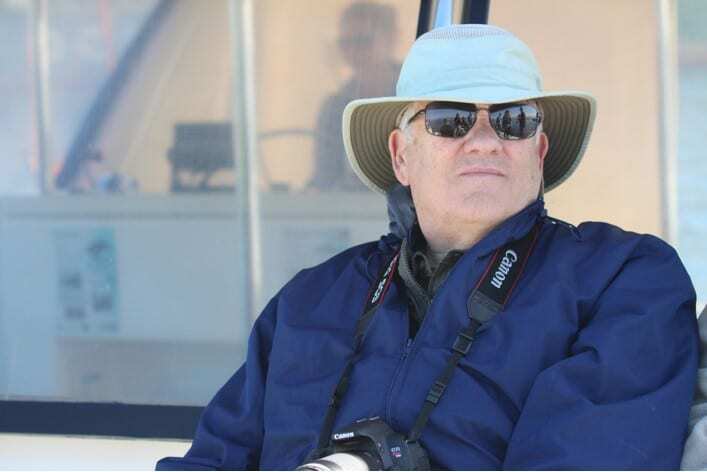 ACEL was a true “guide” to me all through my eight years of student at Ohio State. It was “home base” – the place I went for information of any kind – registration, direction, suggestion, friendship, and especially important – inspiration! The entire faculty was truly “warm and friendly” and supportive in every way. 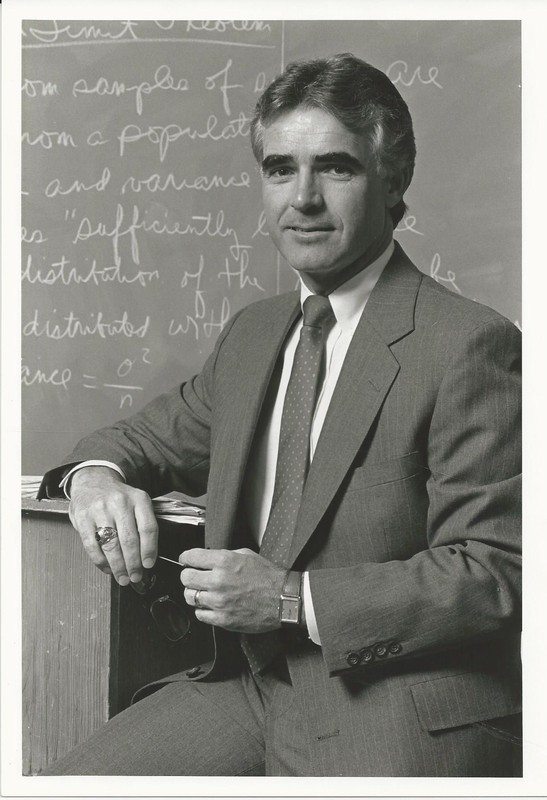 Dr. Ralph Bender, chairman of the department, was usually the first to look up from his busy desk and greet his students. 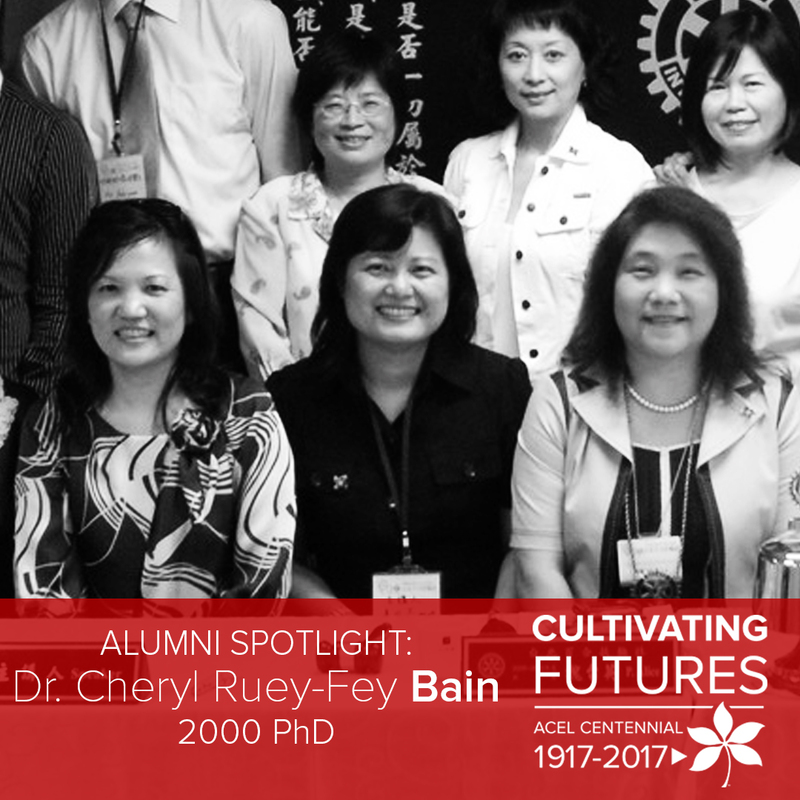 ACEL was truly valuable to me – inspiring and guiding me through my college life and into my “dream” career. 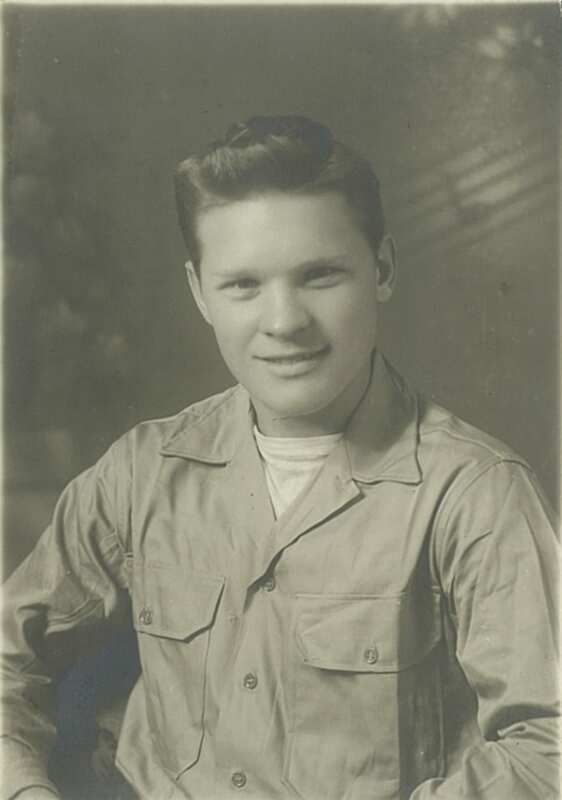 Earl Kantner enters World War II in 1944. 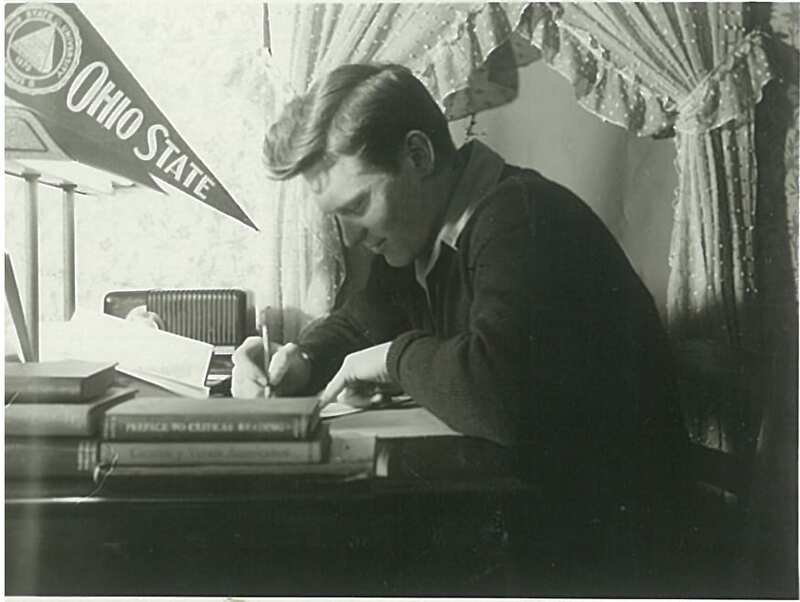 Earl Kantner studies at the Alpha Zeta Fraternity House at Ohio State in 1948. Dr. Earl Kantner appointed to the Ohio Department of Education and Director of the Ohio FFA Association. Earl Kantner reitres January 1, 1984 after 44 years of dedication to Ohio FFA Youth. 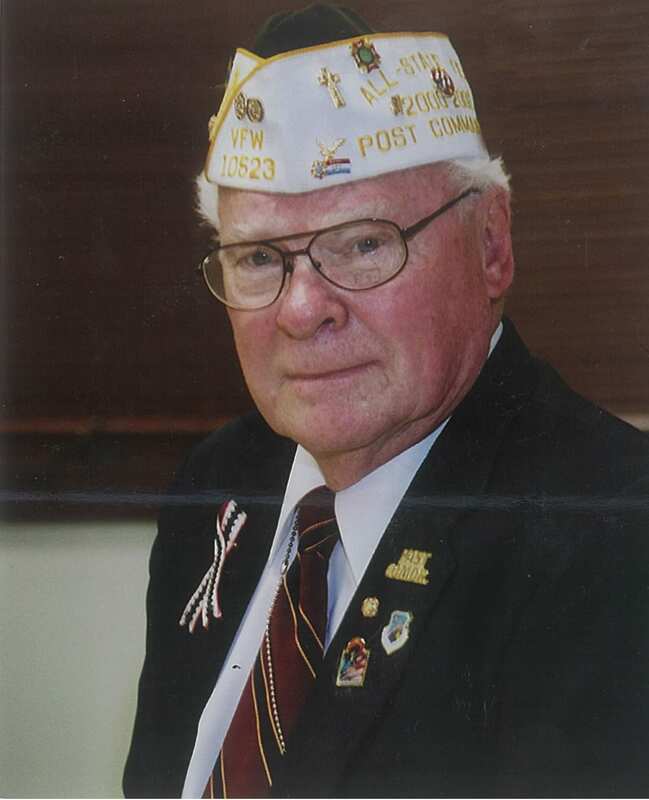 US Army Sgt Earl Kantner heads VFW Post in 2002. 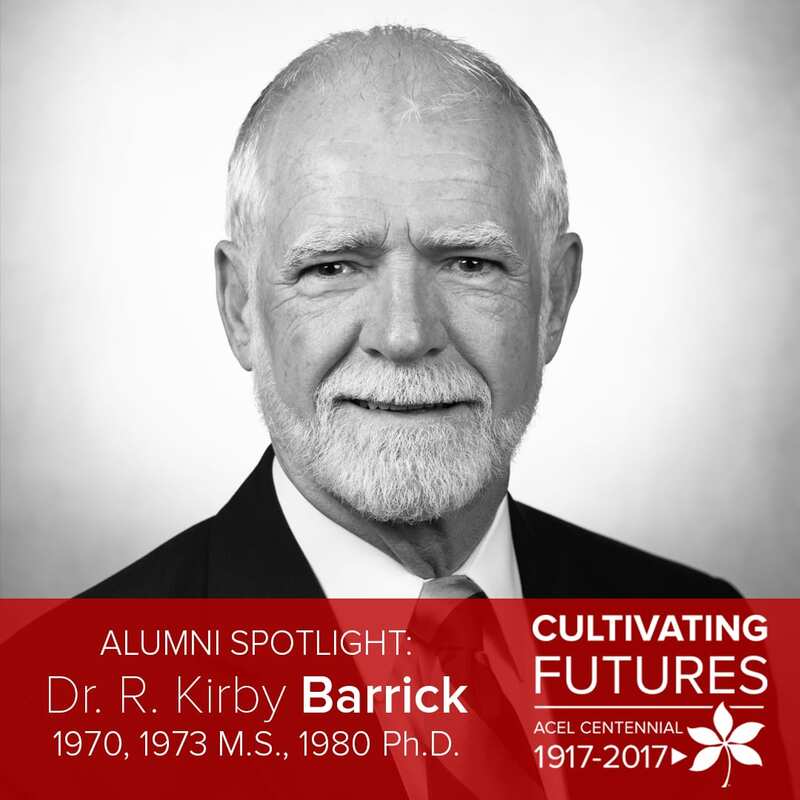 Alumni Spotlight: Dr. R. Kirby Barrick ’70, ’73 M.S., ’80 Ph.D.
Dr. Kirby Barrick ’70, ’73 M.S., ’80 Ph.D. is a three-time alum of the Department of Agricultural Communication, Education, and Leadership, with all three degrees concentrating on agricultural education. 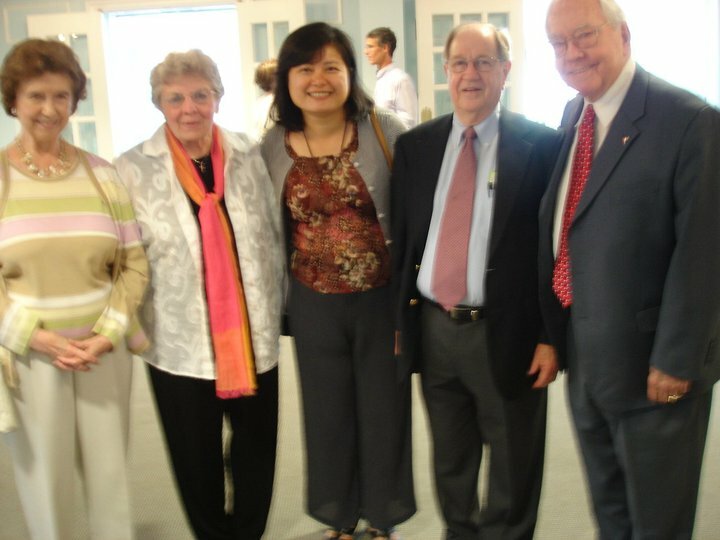 Now retired dean of the College of Agricultural and Life Sciences at the University of Florida and professor emeritis, Barrick resides in Gainesville, Florida. He also served as a member of the ACEL Centennial Endowment committee. Why did you select to major in agricultural education? I knew in high school that I wanted to be a teacher. By my junior year I knew I wanted to be a vo-ag teacher. 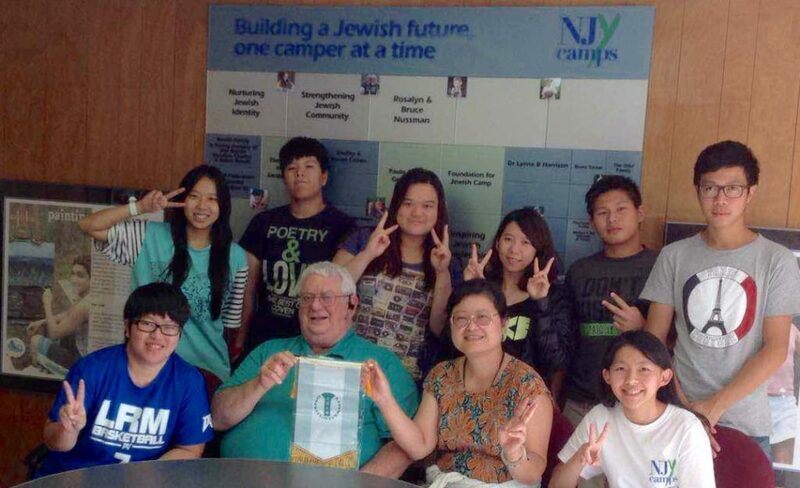 I was greatly influenced by my teacher (John Stimpert); he was the best vo-ag teacher I have ever known! After thinking about going elsewhere, I easily decided on Ohio State. After all, why not – a top college of agriculture and the best agricultural education department in the country. I was well-prepared to be a high school vo-ag teacher. Then things just seemed to develop. Obviously, my Ph.D. in teacher education and higher education led me to a faculty position and eventually into administration. Share with us how you were involved in student life outside of the classroom. I joined Alpha Gamma Rho and served as a vice-president and then president of the chapter. I was president of the Agricultural Education Society. 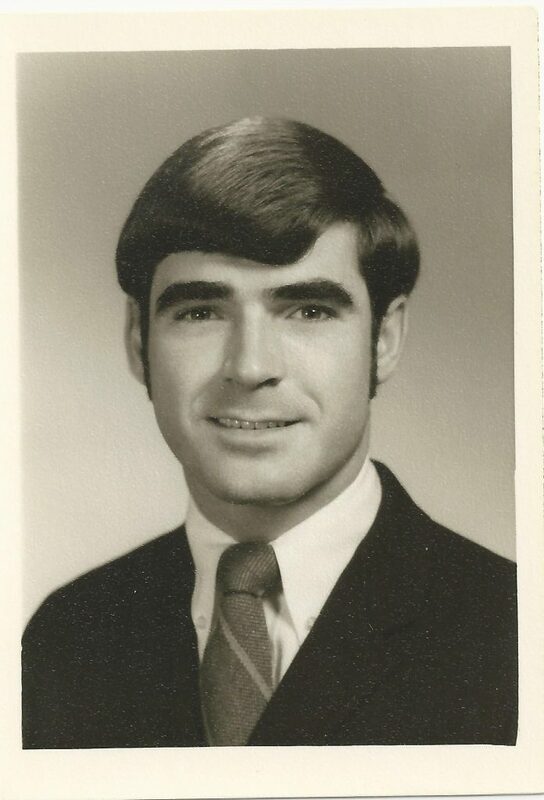 I served on Ag College Council, and Social Board (determined activities at the Ohio Union), was Homecoming Queen Committee Chair, May Week General Chairman, and a member of the Senior Class Committee. I was initiated into Bucket & Dipper. The agricultural education classes, of course, were good and very important for my career objective. I also enjoyed most of the agriculture classes, especially the advanced entomology course. Dr. Bender and Dr. Warmbrod are clearly at the top of the list. I recall being in the graduate teaching methods course with Dr. Bender. While the content was great, watching and learning from a master teacher was phenomenal. Dr. Warmbrod has many of those same characteristics. Alpha Gamma Rho continues to be an important part of my life. AGR and FFA made me who I am today as a person. Those were great times for learning and having fun. I still get together with initiation class buddies each year. Vocational Agriculture Instructor at Sheridan High School (Northern Local Schools), Thornville, OH. Share with us where your career has taken you over the years. What honors and awards have you been presented over your career? Outside of your career, what organizations or activities are you involved with in your community? The department chair is the most important and most difficult position in a university. 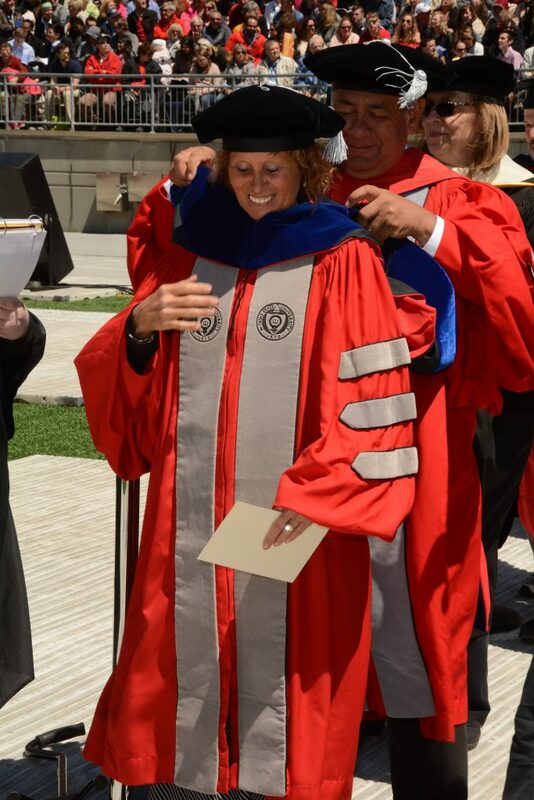 My term as chair at Ohio State was very rewarding. We had limited funds (I had to “give back” a lot of operating money my first week on the job!! ), but the department thrived because we had an outstanding group of undergraduate and graduate students and a devoted faculty and staff. It was a pleasure to serve as chair of the top department in the country and to watch students over the years become successful teachers and Extension agents, university faculty and administrators, and all-around excellent scholars. Remember that the undergraduate experience is two-fold: being successful in your academic pursuits and developing personal skills that last a lifetime. Work hard, study hard, become involved, and give back to your alma mater. I knew in high school that I wanted to teach vocational agriculture. The department was great in helping me develop the skills I needed to begin and advance in a career in teaching and learning as well as in administration. I still enjoy sharing what I learned with others, especially now with university faculty in the U.S. and abroad. 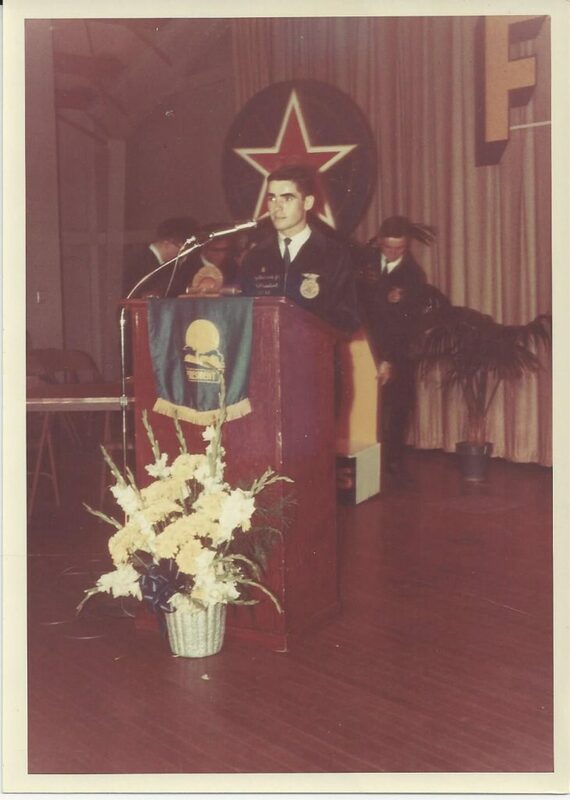 Speaking as the Ohio FFA President in 1966. 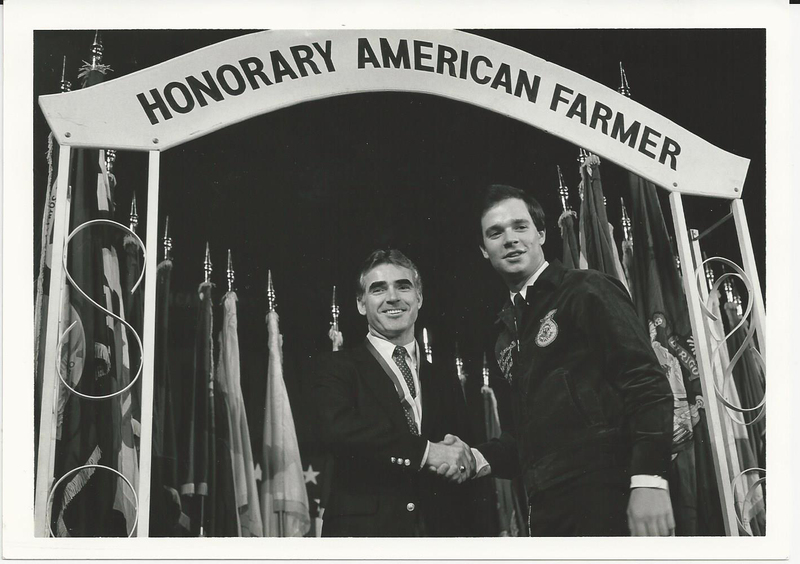 Awarded as an Honorary American Farmer in 1985. 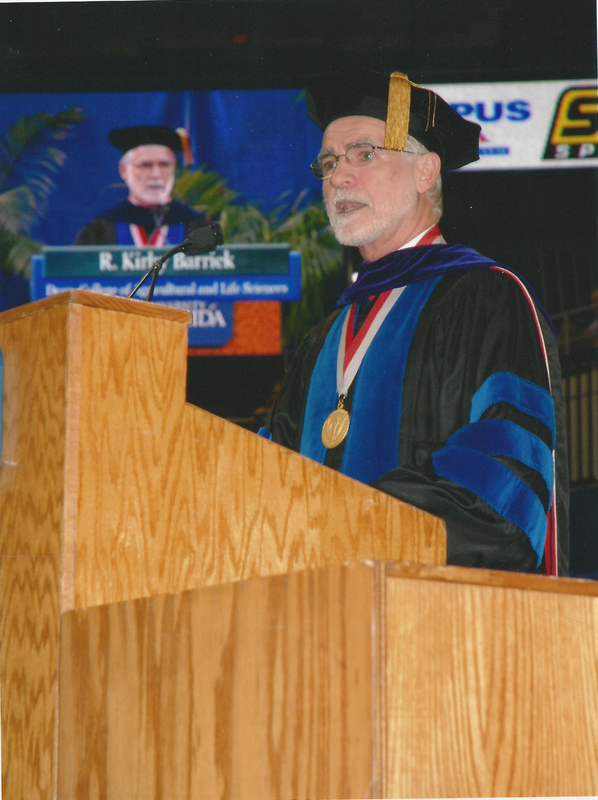 Speaking at the 2007 commencement for the College of Agricultural and Life Sciences at the University of Florida as dean. 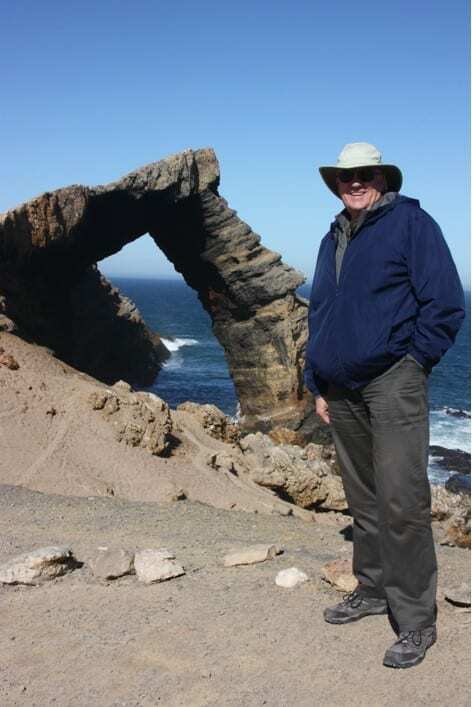 Alumni Spotlight: Dr. Douglas Pletsch ’66 M.S., ’68 Ph.D.
Dr. Douglas Pletsch joined the department in 1965 as a graduate student from Fergus, Ontario, Canada. 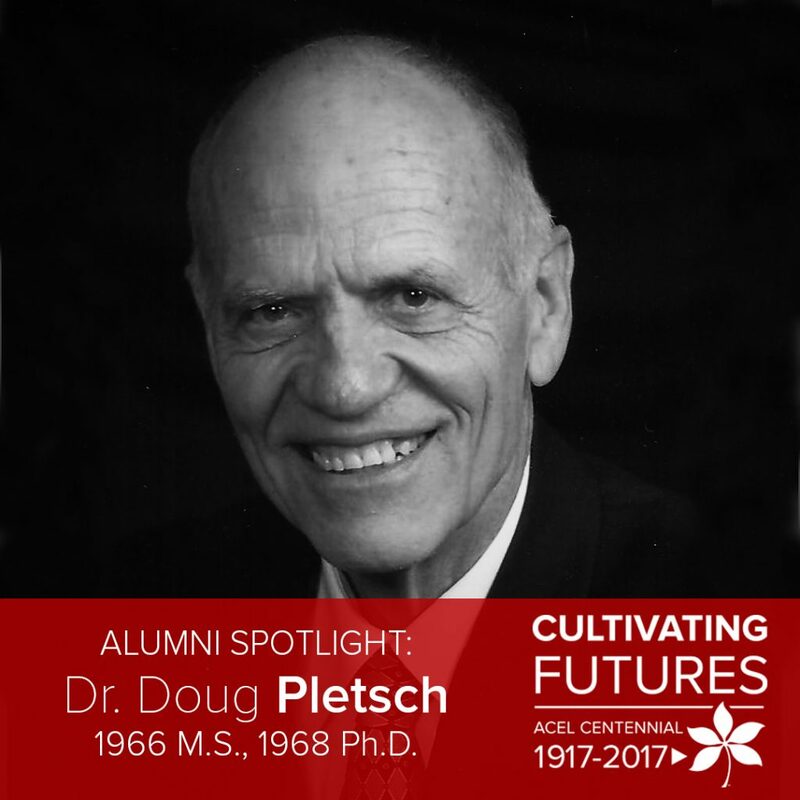 Pletsch completed a master’s and doctorate degree in agricultural and extension education. 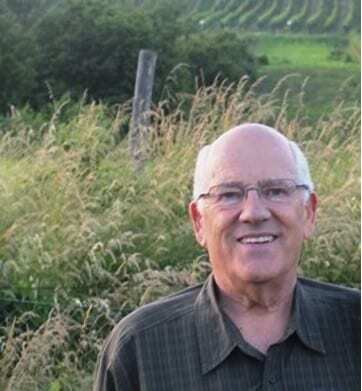 He spent 35 years as a faculty member in rural extension studies at the University of Guelph and retired in 2003. [ACEL]: Hello Dr. Pletsch! 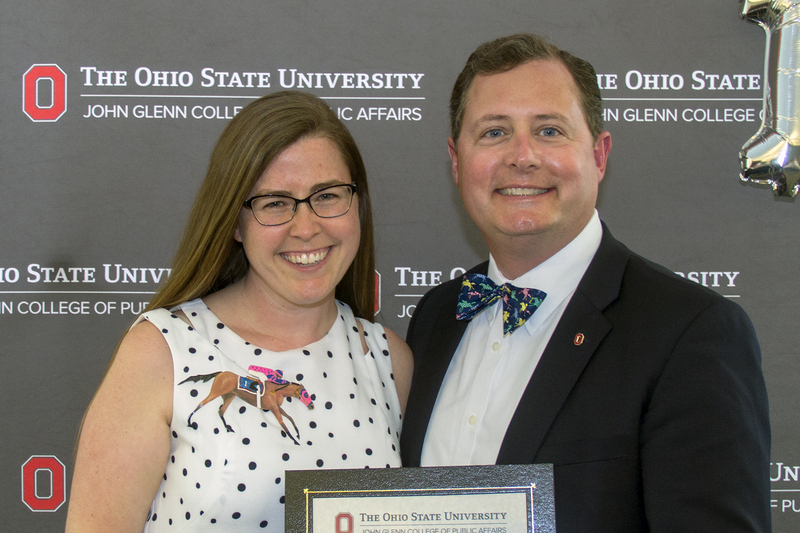 Share with us why you decided to come to the Department of Agricultural Education (now ACEL) to complete your graduate degrees at Ohio State. At the time of application, my wife, Vera, and I were working in a community development project in Brazil, administered by the Evangelical United Brethren Church (now part of the United Methodist Church) in collaboration with the Igreja Crista e Congregacionais do Brasil. My undergraduate degree was in crop science, but it became evident in our work that information dissemination was very important and anything that could be done to facilitate that was a winning approach. 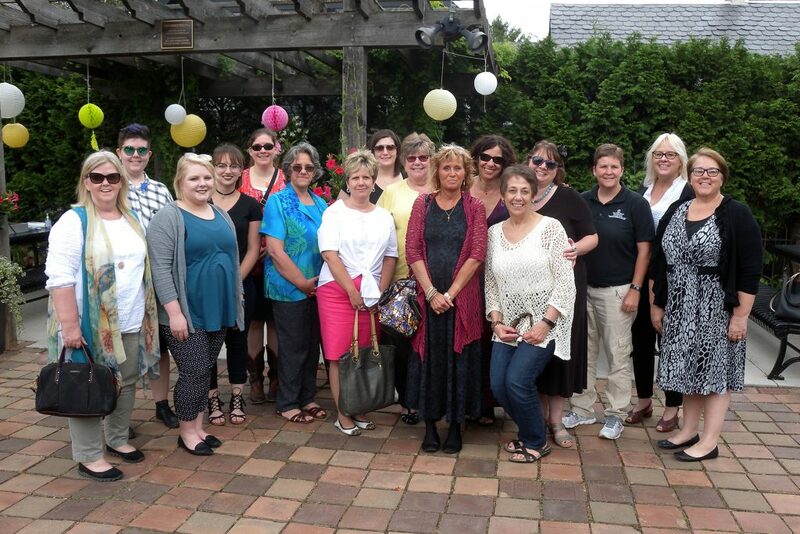 Our supporting congregation was in Marion, Ohio. Having visited Marion and Columbus before going to Brazil, Ohio State was already a consideration when it came time to apply for graduate studies. I applied to three universities in the United States. Ohio State’s application package came via air mail, the other two by sea. By the time I received those applications, I had already been accepted at Ohio State. My time at Ohio State was extremely important. Shortly before completing my Ph.D. I was contacted by the University of Guelph to consider filling a position in the Department of Extension Education. Our plan was to return to Brazil, but because union of the Methodist and EUB denominations was about to take place, the position in Brazil was unclear, and I was advised to seriously consider the position at the University of Guelph, which I accepted. Did you have a faculty member or advisor who was influential during your time at Ohio State? Dr. Robert McCormick was my M.S. and Ph.D. advisor. He was an excellent role model and extremely helpful in making my time at Ohio State a cherished experience. 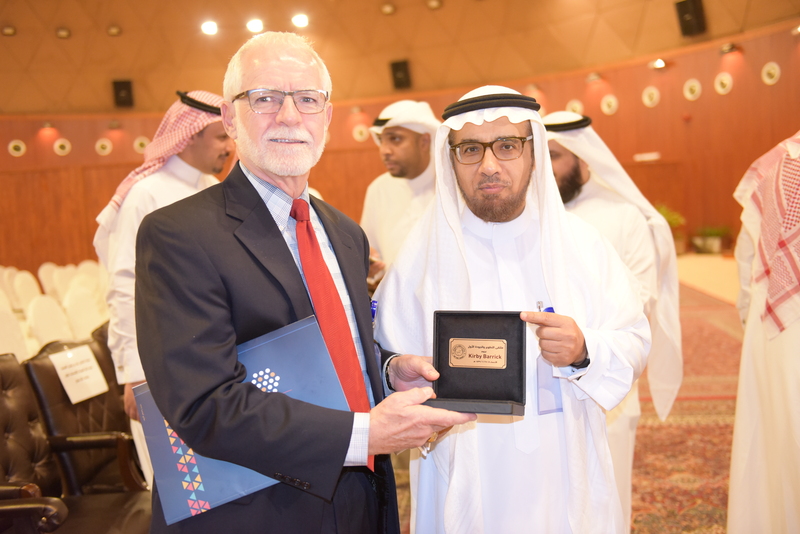 Dr. Ralph Bender, chair of the Department, made us feel welcome, important and provided encouragement. As a Canadian, I was one of a number of foreign students, and without exception, we were well received and felt at ease. Upon graduation in 1968, I joined the Department of Extension Education at the University of Guelph (U of G), in Ontario, Canada and I retired in 2003. My experiences as a faculty member at the University provided opportunities to be involved, not only in at the University but also in the community and in international development projects. What positions have you held throughout your career? Organization: The Agricultural Institute of Canada, The Ontario Institute of Agrology, The Canadian Society of Extension and The Advanced Agricultural Leadership Program. My position at the U of G provided opportunities to be a part of several out of country projects. Our family spent three years at the University of Ghana as part of an institutional building project with that University. Subsequently, I worked with Ryerson University (Toronto) on a project of institutional building at Nur University in Santa Cruz, Bolivia. More recently, I assisted with distance learning projects at Tamil Nadu University in India and another at Mansoura University in Egypt. Life Member, Canadian Society of Extension, Centennial Award of the Department of Agricultural Education, OSU. 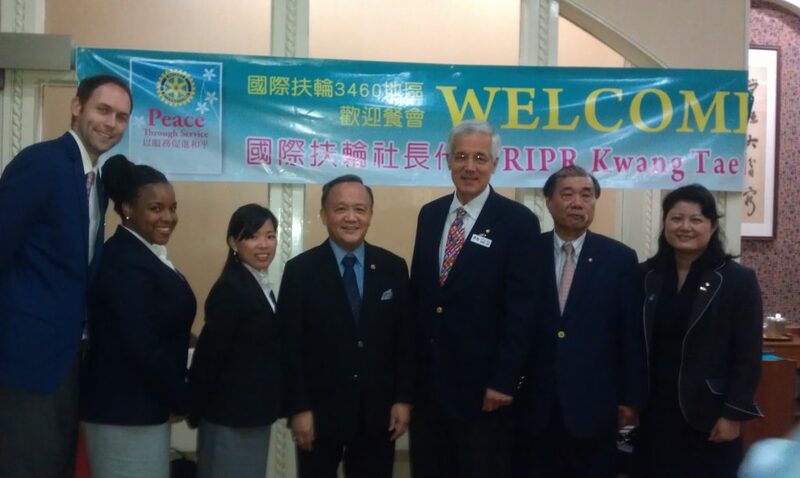 I have been a member of Rotary for the last 19 years. We are also active in our local church and volunteer with the local food bank and other community organizations. One highlight is difficult to bring to mind, I am humbled by the number of opportunities I have had to interact with international colleagues and students in several countries. This has allowed me to experience their culture and observe the desire and work to improve the lives of their fellow citizens. Don’t underestimate your abilities and opportunities. Focus your efforts on helping others. I felt a part of the educational experience at Ohio State. 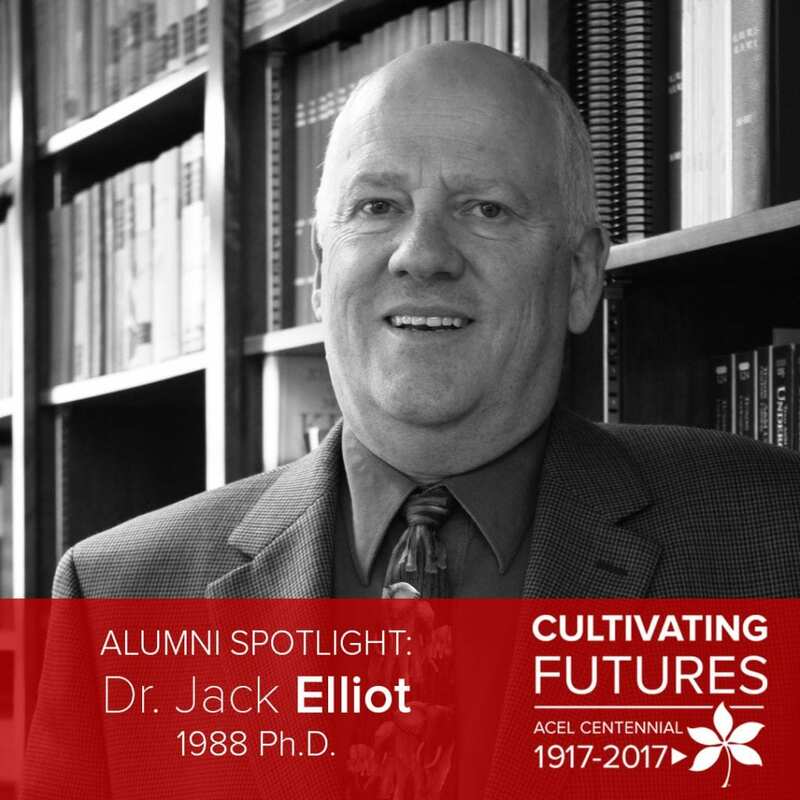 I was extremely fortunate to have professors who provided an optimal opportunity to explore diverse approaches to research and the search for improving lives. I adopted that approach in my own teaching, international activities and working with graduate students. 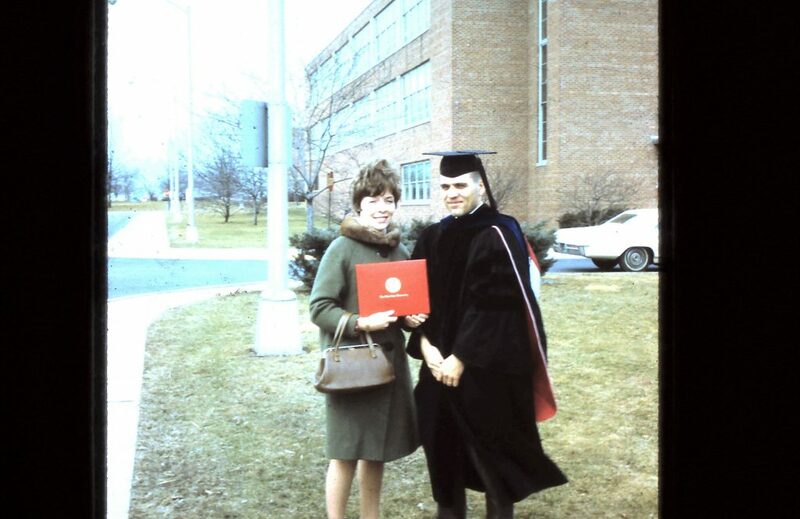 Graduating with my doctorate degree in 1968. 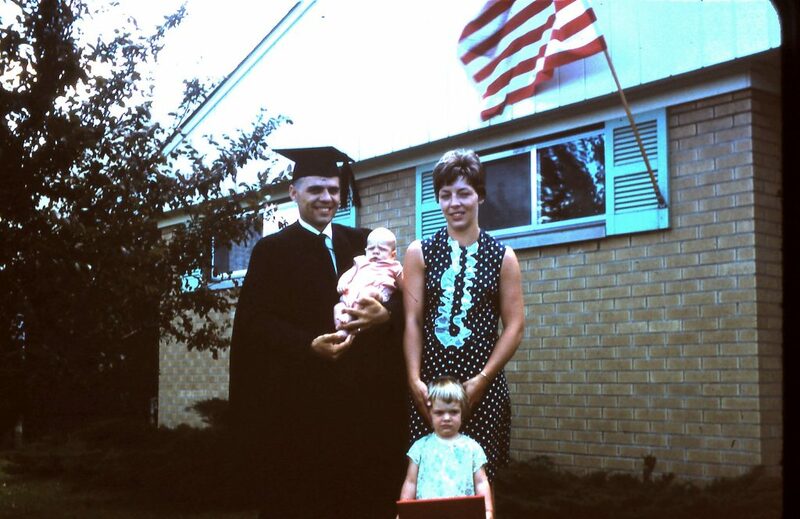 Graduating with my master’s degree in 1966. 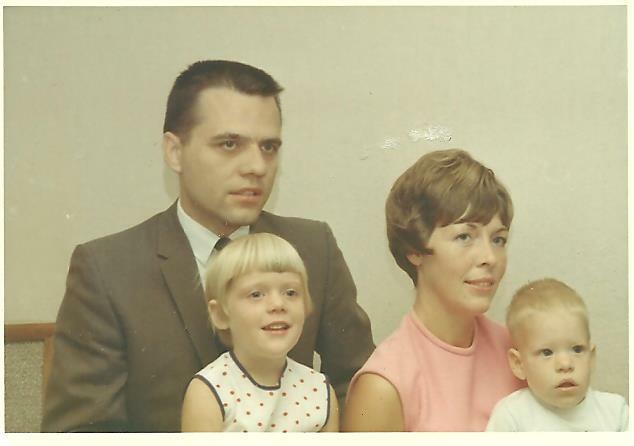 The Pletsch family in 1968. Sarah Jane Duffy graduated in 2002 with a bachelor of science in agriculture. 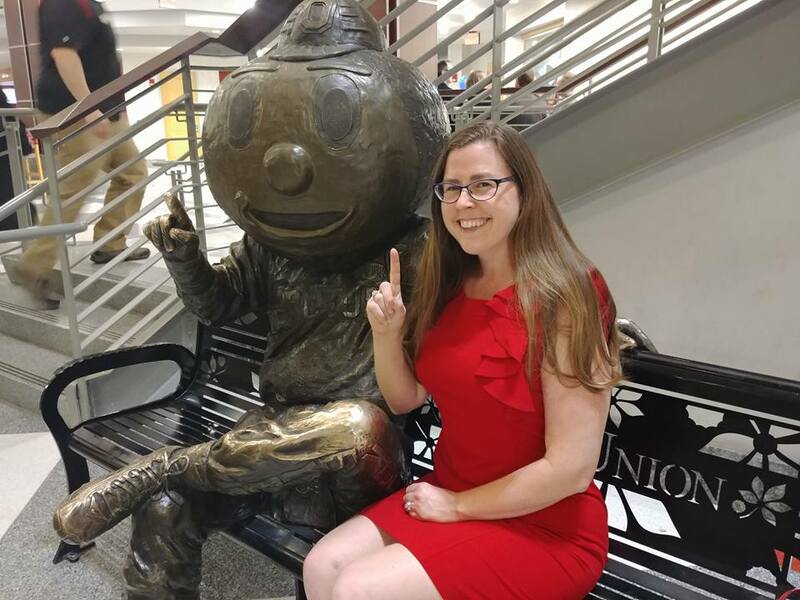 Her major, agricultural communication, prepared her for her career with the Ohio Department of Aging (ODA) where she serves as a public information officer. [ACEL]: Hi Sarah! Tell us why did you select your major? [Duffy]: It was important to me to have a bachelor of science. A degree in agricultural communication allowed me to pursue a communications and photojournalism focused curriculum while maintaining a science background. When I was in 4th grade we took a field trip to the Ohio State farms on Sawmill Road – I was hooked. I immediately started telling anyone and everyone that I was going to study animal husbandry and breed horses when I grow up. In the end I chose Ohio State because it was the best fit for me educationally, athletically (I was on the cross country team my freshman year) and financially. I always say I ended up at the other ODA. I had a strong interest in health and human sciences after abandoning my childhood dream of being a horse breeder. Between my major and my work with the Lantern, The Makio and Columbus Public Health (my internship) I was well prepared to enter the field of public information. Share with us the student organizations and campus life activities in which you were involved. It might be easier to list what the ones which I wasn’t involved. Sigma Alpha, FEAS Student Council, Saddle and Sirloin, Agricultural Communicators of Tomorrow, Beanie Drake Student Leader Endowment Fund, OSU cross country team, intramural hockey, Columbus Symphony Summer Series Board of Directors, photo editor of the Lantern, re-founding photo editor of the The Makio – Ohio State’s Yearbook, I worked at The Faculty Club, to name a few. I enjoyed my laboratory class working on the Lantern the most. Rose Hume made a lasting impact on me. I also loved my fine art photography classes and spending time in the darkroom – back when we used to develop our own photos. Digital photography was just getting a foothold during my college years. Rose Hume, the Lantern staff advisor, and Dr. Sherrie Whaley, my advisor and professor, both made lasting impacts on my career development and guiding me along my education path. Dr. Zartman and Dean Moser also made a lasting impact on me and always made this city girl feel welcomed and appreciated. How do you choose just one? Having my photos of Katy Smith’s number being retired picked up the AP. Showing my first heifer in the Little I. Jumping in Mirror Lake. The fear and excitement of cover the riots on campus that resulted in winning an award for our coverage and my images. My fondest memories are all the people with whom I connected and stay connect with to this day. 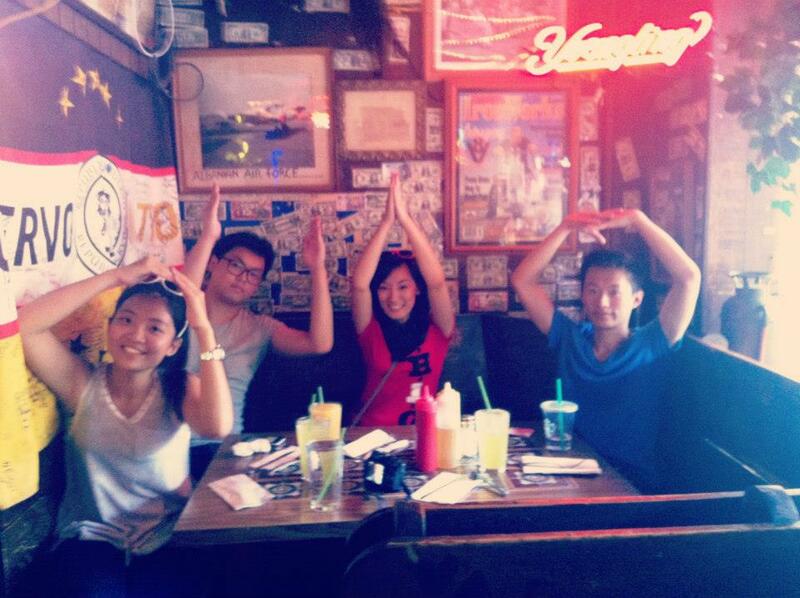 How firm thy friendship isn’t just a line in my favorite song, it’s a very real way of life for us Buckeyes. I have been with the Ohio Department of Aging since December 2002. When you are fortunate enough to make an impact on the lives of your fellow Ohioans and their communities, you just keep on doing what you love. How have you stayed involved in your community outside of your career? I am the president of the Young Buckeyes of Central Ohio. The social media chair for the Franklin County Alumni Club. I am still active with Sigma Alpha sorority and was named the Outstanding Sigma Alpha Alumna in 2015. During your career, have you received any awards or honors? If so, what are those? Employee of the Quarter. We don’t participate in award competitions as it would not be a good use of taxpayer money. So, nothing of note to mention. Meeting with and learning from the amazing older Ohioans I’ve had to pleasure to interact with throughout my career. I enjoy making a difference in lives of our elders as I work to empower them and strengthen our communities, by promoting active aging and positive attitudes toward aging. Be engaged both in, and out of the the classroom. Many of the experiences and relationships I forged outside the classroom had the greatest impact on me and who I’ve become. ACEL cultivated my ability to express myself not only visually, but in written and spoken word. 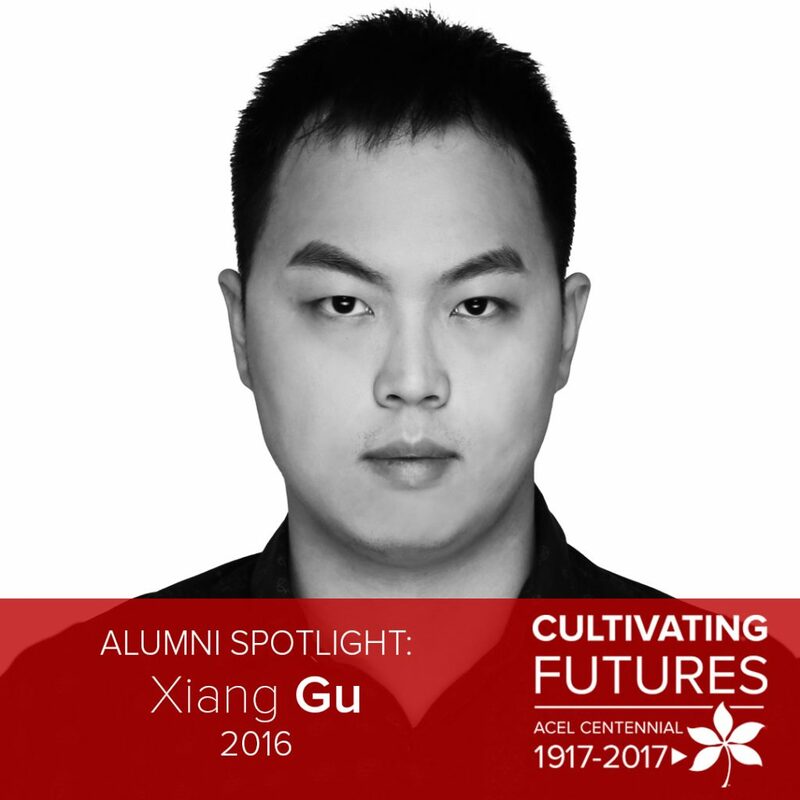 Xiang Gu came to The Ohio State University as a community leadership major for autumn semester 2012 from Guangzhou, Guangdong, China. He was the first freshman to declare this new major (formerly known as specializations of the agricultural and extension education major). After four years in Columbus, “Shaun” graduated with a bachelor of science. 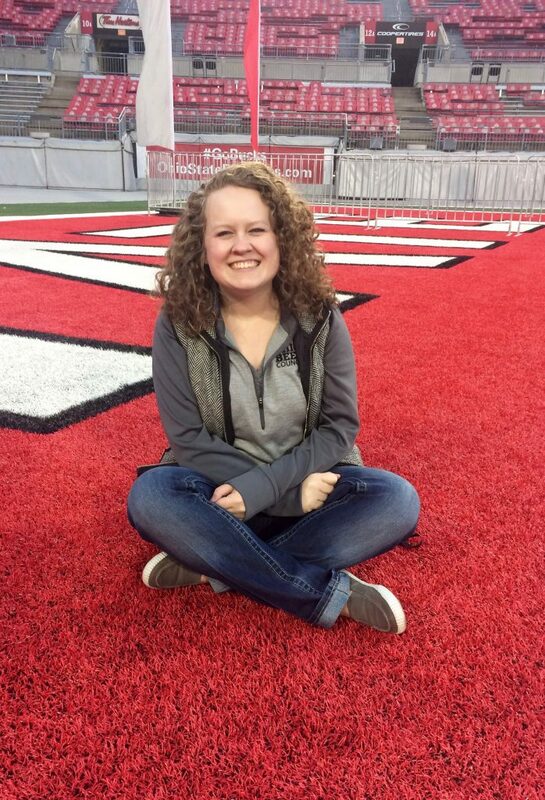 Shaun now works for The Ohio State University in Shanghai, China as an alumni relations and event planning specialist with the China Gateway Office. Why did you select the community leadership major? When I received the [admittance] offer from Ohio State, I also got a list of “recommended majors”. I wanted to pick a major with less Chinese student and this major caught my eye. After the discussion with my parents I made this bold, but right decision. Good question for international students – most of us haven’t been to the United States of America before we started our campus life, including me. So we choose the school based on the information online and from our friends. My reasons were: 1. good academic reputation, 2. affordable tuition fee and 3. located in urban area. Well I think my job now is kind of self-explained. Ohio State not only offered me great academic resource, but also a global vision. So I would like to share this great experience with more Chinese students and alumni. How were you involved in the campus outside of our academics? 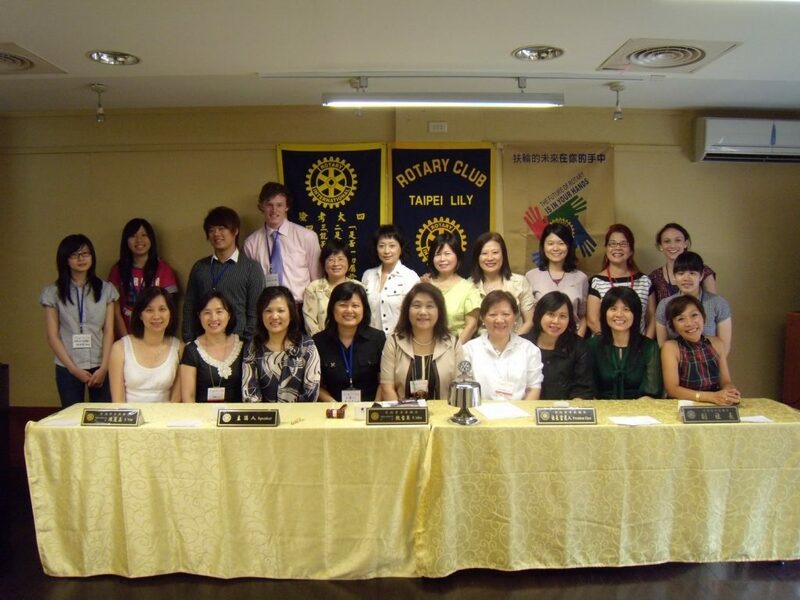 I have some friends from Taiwan so I joined TWSA in my freshman year. It’s a difficult question. I will say photography. Although I didn’t do well in that class, I did learn some skills from this class – and it’s very useful in the real life. I will say Dr. Robert Birkenholz and Dr. Jeff King. 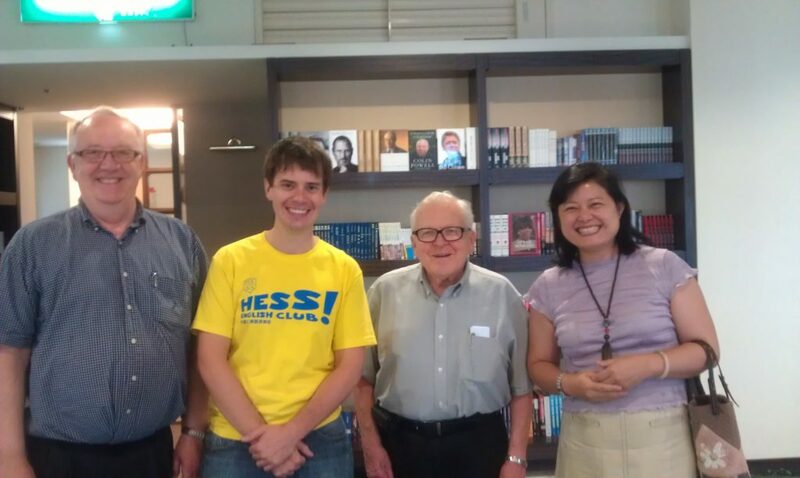 They not only helped me with my studies at Ohio State, but also offered a lot of help in my campus life. They shared their own experience, knowledge and time with me selflessly. I sincerely appreciate their help during the time I spent at Ohio State. The time we won the [football] National Championship in 2015. Celebrating with other friends on The Oval. I worked in a small local company in Columbus as an E-commercial operation specialist. 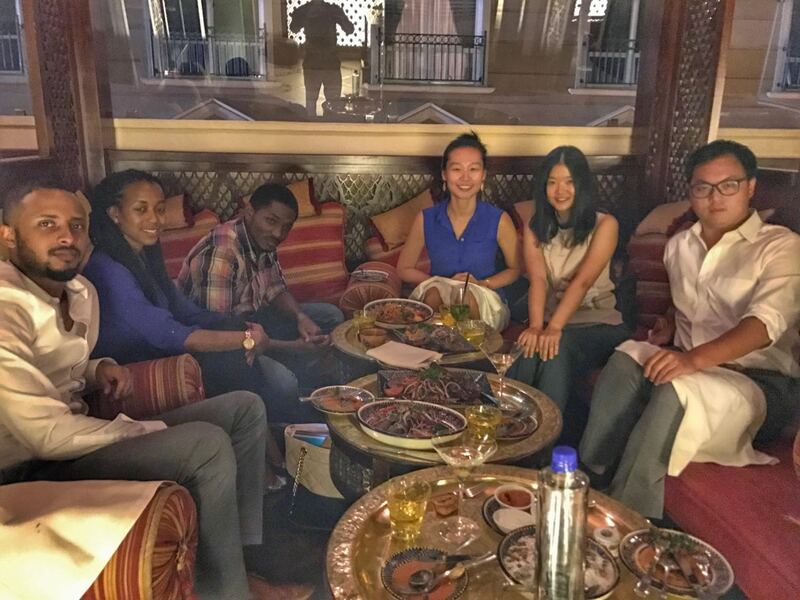 After the job in Columbus, I went to Africa (Angola, Kenya and South Africa) and worked for McKinsey as a project assistant. Then I went back to China to serve the buckeye community. 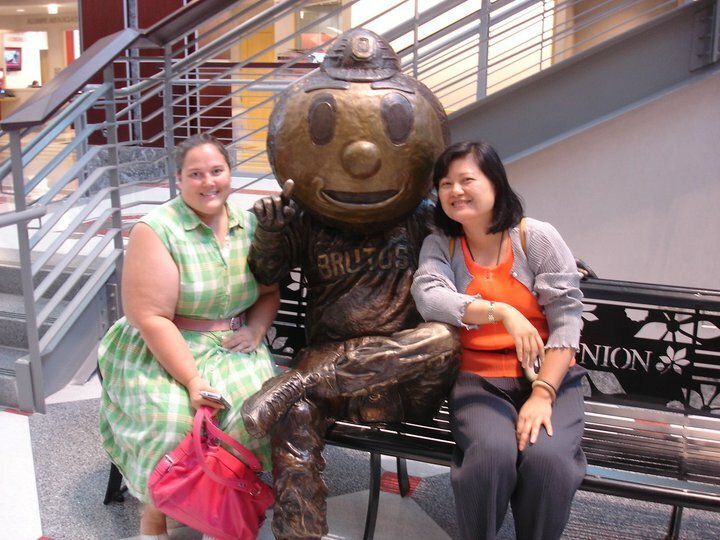 I worked close with buckeye community in the Greater China area and involved in nearly every alumni events. I will say the time I spent in Africa with Mckinsey. Take a broader view. This world is big and try to explore it before the death. Global vision and critical thinking through the ACEL education program and staff. During my work in Africa with McKinsey.